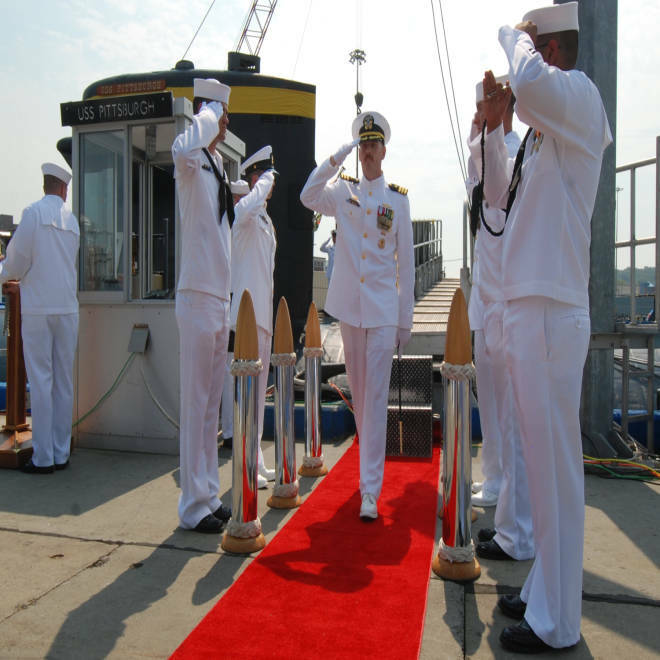 Michael Ward II, center, when he took command of USS Pittsburgh on Aug. 3. The former commander of a Navy submarine -- who was relieved of duty on Friday after only a week on the job -- reportedly tried to fake his own death to get out of an extramarital affair with a Virginia woman. But a 23-year-old Virginia woman provided details to The Day newspaper of New London, Conn. about what she said was a 10-month affair with Ward, 42, whom she met on a dating website in October. "Our Navy has a very clear and unambiguous standard regarding the character of our commanding officers, spelled out in the Charge of Command. I reviewed this Charge with Cmdr. Ward before he assumed command. He understood the Navy's high standards for command leadership and he failed to uphold them." The woman told the paper that Ward used the name Tony Moore in his emails and that she only learned when she met him in person his true identity. According to The Day, the woman stated that Ward also said he was separated from his wife and in “special ops.” Months into the purported affair, the woman said she received an email from the account Ward had used to communicate with her. The email stated a co-worker of Ward’s named Bob was writing to inform her of some news. "I am extremely sorry to tell you that he is gone,” the email dated July 6 said, according to The Day. “We tried everything we could to save him. I cannot say more. I am sorry it has to be this way." A few days later she said she drove to Ward's house in Burke, Va., to pay her respects and learned from another person living in the house that Ward was not only alive, but had moved to Connecticut to take command of a submarine, the USS Pittsburgh. During the ordeal, she told the paper that she became ill and was hospitalized and found out she was pregnant, but that the baby was lost. According to the Navy, before taking command of USS Pittsburgh, Ward served on the Joint Chiefs of Staff at the Pentagon.